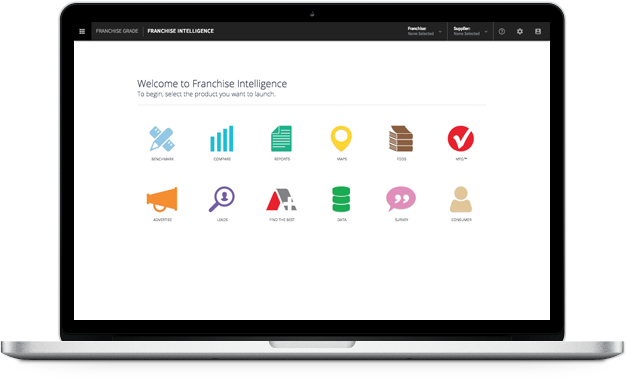 Franchise Intelligence™ brings together everything you need to study and analyze the franchise industry. Whether you’re a franchisor, broker or prospective franchisee, Franchise Intelligence gives you the tools to make data-driven decisions that propel your business forward. One simple subscription provides you and your team access to the most powerful franchise database in the world. Franchise Intelligence will help to drive your business to franchising success. Ready to up your franchising game? Get on the platform used by the pros. Request your demo today. Benchmark brings together key statistics from across the industry to help you analyze problems in business activity and apply quantitative techniques to refine your franchise growth strategies. Use our research to understand the fundamentals of franchising, determine your needs and develop a deep understanding of how to better perform. Use the report card feature to get instant, printable summaries. Compare is the foundation to understanding how any franchise benchmarks against its key competitors. Compare and filter franchise data, explore multiple visualization types and customize your print-ready reports. Bring your data to life in a way that spreadsheets and traditional static research can't match. Compare up to 5 franchises simultaneously on more than 500 datapoints. Access hundreds of Franchise Grade research papers that combine statistics and findings with key insights from our veteran Franchise Analysts. Our report series includes: Facts & Figures, Sector Reports and Industry White Papers. Keep tabs on industry trends with the latest reports from our experts. With over 13,000 Franchise Disclosure Documents (FDDs), this is your one stop shop to find FDDs on every franchise going back over a decade. Filter and sort documents using advanced search features and receive your downloads instantly with no waiting. Unlimited download options are available. Quickly search and download from our FDD library. Map franchise outlets across states and years while overlaying competitor or sector growth and contraction. Identify and target development areas to maximize growth with dynamic geo-visualizations. Visualize key data points across states and brands to see how you stack up against competitors. To grow and prosper, a healthy franchise system needs to promote its advantages to prospective franchisees. Franchise Grade works with you to grow your brand and your long-term success. We grade and promote only healthy franchises systems like yours to ensure that franchising stays profitable. Use our library of assets to promote yourself as a healthy franchise brand. Increase brand engagement and promotion by making your marketing efforts smarter and more data-driven. Promote your business to the best candidates in the right locations and deliver a higher engagement rate on ads by incorporating custom-tailored messaging and material. Customize how your brand is presented and create engaging content for your landing page. Streamline your sales efforts by using leads to intelligently target qualified candidates and have them automatically delivered to your CRM. Use our lead analysis tools to better understand buying signals and increase candidate buying behavior. Use advanced criteria to target only the leads you want. Search thousands of franchise offerings to find the best investment based on your specific and personalized criteria. Filter and sort by type, maturity and location to find the right franchise opportunity for you. Filter through the noise to find just the right franchise. Monitor your consumer satisfaction to ensure all franchisees produce the best service for your customers and clients. Confirm brand equity across all locations. Review sentiment across various sources to track your brand health. Focus on key franchise metrics that fit your specific needs with our pay per system data model. Filter franchise systems based on sector, size, growth, territory, initial investment, royalty rate, franchise fee, legal actions, or any other variable to create a targeted franchise system list. Instantly export information-rich spreadsheets containing only the data you need. Use our powerful survey engine to receive candid feedback from your franchisees and collect vital data from consumers. Keep the pulse of all parts of your business, so you never miss a beat. Capture real-time feedback with beautiful and professional surveys.